Answer 3 questions to see if you qualify to receive a free trial offer of RestoraLAX. There is a limit of two (2) trial offer deliveries per mailing address. It will take up to 4 weeks for your trial offer to be delivered. 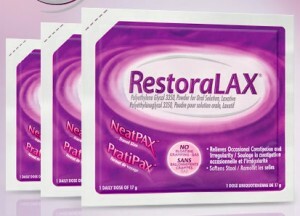 RestoraLAX effectively relieves occasional constipation without any bloating, gas or cramps, so you can get back to being you. RestoraLAX works with water to hydrate and soften stools, bringing you relief from occasional constipation and allowing you to get on with your day.